Excellent for decorating sweet and savoury meals. 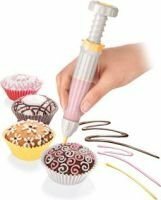 With 2 nozzles for normal as well as very intricate decorations, a funnel for easy filling, practical closure for the nozzles and a multi-purpose cleaning piece. Made of excellent silicone and resistant plastic; the silicone body of the pen is dishwasher safe.